In little more than a month, free software hackers, lawyers, activists, students, educators, librarians, and community organizers will gather to Fork the System. Hundreds of people from around the world will meet at LibrePlanet 2016: Fork the System, March 19-20, 2016 at MIT in Cambridge, MA. This year's conference program will examine how free software creates the opportunity of a new path for its users, allows developers to fight the restrictions of a system dominated by proprietary software by creating free replacements, and is the foundation of a philosophy of freedom, sharing, and change. Sessions like "Yes, the FCC might ban your operating system" and "GNU/Linux and Chill: Free software on a college campus" will offer insights about how to resist the dominance of proprietary software, which is often built in to university policies and government regulations. Activists from EFF, April, FSF Latin America, and the Dudley Street Neighborhood Initiative will talk about the possibility of changes to copyright law in the US, how to De-Google-ify the Internet, how our world resembles dystopian sci-fi, and how to bolster asset-based community development work. There are opportunities to learn to use free software, too: there will be an introduction to using Python in the 3D creation program Blender; a workshop devoted to LittleSis, a wiki-style database that tracks connections between the world's most powerful people and organizations; and an overview of the secure, distributed voice, video, and chat communication platform Ring. There will be four keynotes devoted to free software in relation to surveillance, philosophy, and more. We previously announced our opening session, a livestreamed conversation between NSA whistleblower Edward Snowden and ACLU Technologist Daniel Kahn Gillmor, "The last lighthouse: Free software in dark times," and we are pleased to announce our three other keynote speakers: Allison Randal, president of the Open Source Initiative, Karen Sandler, executive director of the Software Freedom Conservancy, and Richard Stallman, president of the Free Software Foundation. The full draft program is now online. Check it out, then register – we anticipate very high attendance this year, and advance registration is the best way to guarantee admission to LibrePlanet. Remember, FSF members and students attend gratis. Each year at LibrePlanet, we gather software developers, activists, policy experts, and computer users to share accomplishments, learn skills, and address challenges to software freedom. Newcomers are always welcome, and LibrePlanet 2016 will feature programming for a broad range of experience levels, including students. LibrePlanet 2016 is produced in partnership by the Free Software Foundation with the Student Information Processing Board (SIPB) at MIT. You can also pre-order a LibrePlanet 2016 commemorative t-shirt in the GNU Press shop. Order your shirt by Thursday, February 25th to guarantee availability in your size. LibrePlanet started out as a Free Software Foundation membership meeting, but now it is much more. The conference would never have become the highly anticipated event it is today without the commitment of dozens of volunteers who aid with the planning and execution of LibrePlanet each year, in a variety of roles. We are still looking for volunteers for this year's event. If you are interested in helping out, complete the volunteer interest form. We show our appreciation for our volunteers by offering gratis conference admission and a LibrePlanet t-shirt. Don't miss out on your chance to Fork the System. 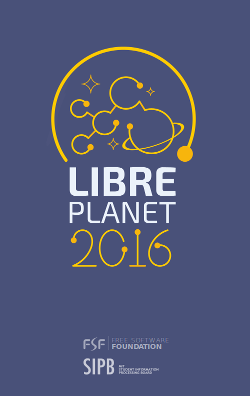 Register for LibrePlanet 2016 today!